The yudim in the first mezuza have a regel that is very long [see also the word בניכם] – much longer than the width of the head of the yud. This causes a big shayla! Are these yudim kosher or maybe they are classified as vavim?! And fixing them in tefilin or mezuza is pasul since it is Sh'lo C'sidran. It is obvious in the poskim that the defining point that divides yud from vav is shailas tinok, if so does this automaticaly accept any yud at any length because in regard to the general csav the yud is shorter than other letters, or maybe there is a shiur for the yud that it may not pass, as the [opposite] minimum shiur that the vav can not be shorter. In the second mezuza the yudim are worse, not only the regel is longer than the width of their head – the regel descends straight down, without a curve inward at all. To my opinion these yudim are pasul, they are [more a] vav than a yud!!! 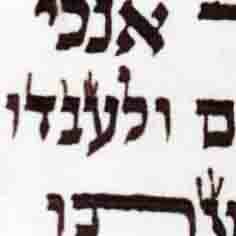 Although these yudim are shorter than the general csav, the porportion between the yuds' head (rosh) and foot (regel) is distorted, and doesn't fit the basic measure of the letter. 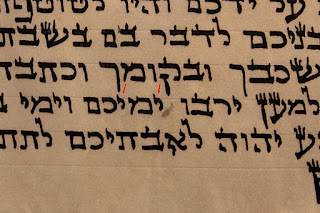 In the last line the second Zayin of מזזות – the person adding tagim caused an influctuation of the Zayins head (I hope the picture comes out well enough to see, the white line cutting through is the flashback from the sirtut). This caused the Zayin to lose its correct porportion, instead of the rosh being aprox. 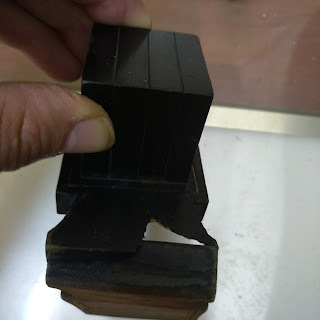 1/3 of the letter and the regel 2/3, they are almost equal or the head might be a bit thicker than the foot. I think this problem is depending on an argument between Shulhan Aruch Harav 32:20 and (צריך עיון doubt of) Pri Megadim quoted by Mishne Brura (Biur Halcha 32:16 דיבור המתחיל כגון וי"ו וזיי"ן) how is the measure of the length of vav and zayin determined. In the third mezuza notice that the yudim are porportionaly correct in regard to the general csav, but some of them their heads are a 1/3 or less of the size of the letter, making their regel longer and dominant. If the yud would be examined outside of the mezuza, and seen by itself, would it be a yud?? Don't the letters have to be correct also in regard to their own porportions? Most magihim and rabonim once they can clearly define a difference between the yud and vav, because the yuds regel is bent/curved inward, or because the yud is shorter then the line, and if a tinok would be shown the whole line would obviously recognize the yud different from a vav - accept this as a kosher yud. 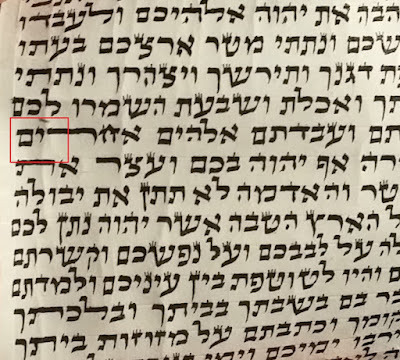 I hope bezras hashem to explain in this forum, that there are 2 basic shitos in the poskim as determining and explaining what the gemara "שלא יעשה יודין ווין" means. The first opinion (I think) is of the Shulhan Aruch following the Rambam and Rosh, the second of the Rema following the rishonim Baal Hatruma and Mordechai. The outcome of this difference is not only in regard to yud or vav, but much wider to other letters and the basic attitude to csiva tama. Most of what i will write is already recorded in Osyos Harav - but there it is in Hebrew, and not condensed in one place, rather pieces of the idea here and there. In this blog i will try to write the points and outcome.